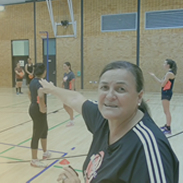 Here is a summary of the rules of the game of netball as outlined in the Official Netball Rules, published by the International Federation of Netball Associations (IFNA). It's not possible to include all the rules of the game in this section. There are so many that every netball player learns a new rule every once in a while, no matter how long they've been playing! The aim is to provide you with a basic understanding of the rules to be able to play the game safely and enjoyably. Please use this section as a reference to answer any questions you may have about umpiring decisions. Copies of the rule book can be obtained from England Netball. Teams shall consist of 7 players. There must be at least 5 players, one of whom must play centre, to enable the fixture to go ahead. Substitutions can only be made at half time or when a player is injured. There is no limit to the number of substitutions that a team can make. If you start a match with 5 or 6 players but more members of your team arrive after the game has started, they must wait until the next centre pass before being allowed to join the game. The first centre pass is decided between the two captains by the toss of a coin. The centre passes then alternate between the teams, regardless of which team has scored. Before the whistle, all players must start in the goal thirds except the two Centres. The Centre with the ball must be wholly within the Centre Circle and must obey the footwork rule after the whistle has been blown. The opposing Centre stands anywhere within the Centre Third and is free to move. A player must not break at the centre pass, which is moving into the Centre third before the whistle is blown for the Centre pass. A free pass would be awarded to the opposing team in any of these instances above. The footwork rule still applies in the centre circle. As soon as the Centre steps into the circle, their leading leg becomes their landing foot and the footwork rule then applies. That is, if they lift or move their landing foot and place it back down again, a free pass will be awarded to the opposing team due to footwork. A player with or without the ball cannot move into an area of the court that is not designated for their position. This will result in a free pass being awarded to the opposing team. With both feet grounded or jump to catch the ball and land on two feet simultaneously. You may then take a step in any direction with one foot (but not both) and pivot on the spot with the other foot. Once one foot is moved, the other is considered to be the landing foot. With one foot grounded or jump to catch the ball and land on one foot. The landing foot cannot be moved, other than to pivot on the spot, whilst the other foot can be moved in any direction. Once the landing foot is lifted, it must not be re-grounded until the ball is released. Hopping or dragging the landing foot is not allowed. A player attempting to intercept or defend the ball must be at least 3ft (0.9m) away from the player with the ball. This distance is measured from the landing foot of the player in possession of the ball. The defender may jump to intercept or defend the ball from this 0.9m (3ft) feet distance but you must ensure if you do jump to defend a ball, you do not land any nearer that 3ft or this is obstruction (i.e. shortening your distance). A penalty pass will be awarded if you obstruct a player as described above. These instances are not classed as obstruction but you will be penalised if you mark a player with your arms out. "No player may contact an opponent, either accidentally or deliberately, in such a way that interferes with the play of that opponent or causes contact to occur." Position so closely to an opponent that the player is unable to move without contacting (this refers to when a player is being double marked, usually a shooter). Push, trip, hold or lean on an opponent or use other forms of physical contact. While holding the ball, push it into the hands of an opponent. Generally, an attacker is moving into a space to receive the ball and a defender is drawn into causing contact when trying to intercept. If the attacker was in that space first, the decision goes their way and against the defender. A defender must be able to intercept the ball cleanly. However, no contact is allowed off the ball. This includes attackers pushing off, backing into or pushing through a defender to get into space to receive the ball. If the defender was in that space first, then the decision goes their way and against the attacker. The umpire's role is to watch the game and determine which player is causing contact to occur. It may not always seem obvious to you as a player why a particular decision has been made. The umpire is there to judge whether it is the attacker or defender who is committed to a particular space on court and therefore which player is causing contact to occur. The umpire should stand at the position at the side of the court where they want the penalty to be taken from. If you are ever unsure where to take the penalty from, you need to look at the positioning of the umpire for guidance. Failure to set the penalty correctly in this way will result in a reversal of the penalty and a free pass to the opposing team. A lot of contact disrupts the flow of the game. It also puts your team at a tactical disadvantage because when a player is taken out of play on a penalty, they are not able to contribute to the team's defence. It is far better to pull out of a challenge if you think you are going to contact the player and concentrate on defending the next pass instead. The penalised player must stand beside and away from the player taking the penalty so as not to impede this player in any way. The penalised player may not move or attempt to take part in play either physically or verbally until the ball has left the hands of the thrower. Please observe the above rule if a penalty is given against you! You have 3 seconds from setting the free pass/penalty in which to take it. If you decide that another player would be better taking it, you must place the ball back on the floor. Do not walk towards the other player to pass it to them (footwork) or hand it to them (short pass). Any opposing player allowed in that area may take the free pass/penalty. Only the GS and GA are able to score goals for your team. They must be wholly inside the goal circle to shoot. The ball is thrown back into play from the point where it went off the court. It is out of court when it contacts anything outside the court area (except the goalpost). When taking a throw in, a player places her foot up to but not on the sideline or backline of the court. The lines are part of the court. If any part of your foot is touching the line or you step into the court in the process of taking the throw in, this is deemed to be a foul throw. This includes walking on the court to pass the ball to another player if you decide that they should take the throw in. In this instance, you should leave the ball on the floor outside the court for the player to then pick up. You have 3 seconds from when you take up your position at the side of the court in which to throw the ball. You must also wait until all players are back on the court before taking the throw in. If any of the above occurs, a throw in to the opposing team will be awarded. The ball cannot be thrown over a complete third of the court without being touched or caught by a player (i.e. it cannot cross two transverse lines). A free pass shall be taken from the area where the ball crossed the second transverse line (i.e. where the ball should not have been). toss the ball into the air and catch it again without it being touched by another player. At the moment the ball is passed there must be room for a third player between the hands of thrower and catcher. This is quite a common error between shooters and centre court players around the circle. Players must remove all jewellery before the start of a match to avoid injury to you as a player and your opposition. This rule includes all ear piercings, including piercings high on the ear lobe. Covering piercings up with a plaster is not adequate! The only exception is a wedding band or a medical alert bracelet which can be worn but must be taped up. Failure to remove jewellery will result in a player not being allowed on court. Nails must be kept short. As a guideline, nails should be no longer than 1mm long and should not be seen from the underside of the finger. This is to protect other players from injury. This is not a popular rule but it will be strictly enforced to avoid any unnecessary injuries occurring to players taking part in the league. Players will not be allowed to start a match with long nails.